Rarely does everything in life go perfectly according to plan —and, on occasion, for good reason, too. 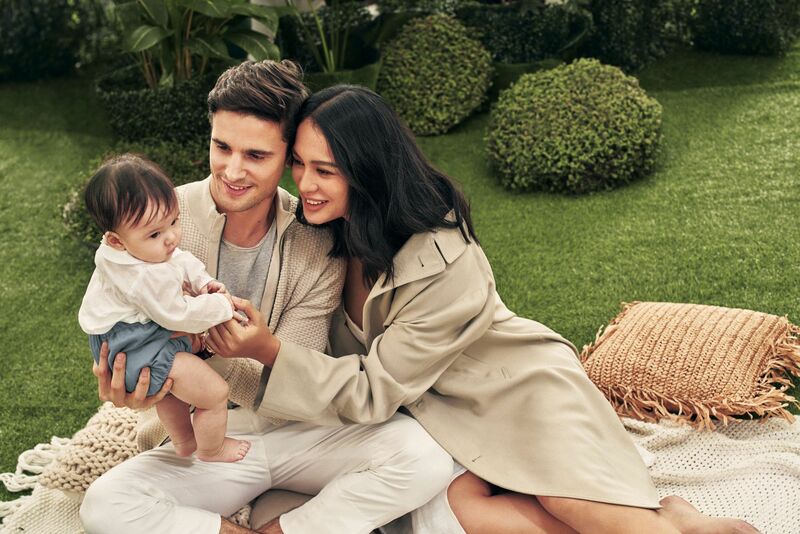 When Adrien Semblat and Isabelle Daza- Semblat crossed paths a decade ago, falling in love was the furthest thing on both of their minds. Isabelle, who, at the time, was working on building a promising career in show business, was not looking for anything long-term. Adrien, who had just moved to the Philippines from his native France, was preoccupied with navigating his way through a foreign country while starting a new chapter in his career. But as fate would have it, they wound up at the same social gathering and clicked almost instantly. An all-around cool girl with a passion for fitness, actress, host, and entrepreneur Isabelle was a tomboy growing up, often playing football and basketball with her cousins when not in school. She was initially drawn to show business by the profits she would reap, but eventually grew to enjoy it because it gave her a platform by which she could entertain others. Aside from her hosting and acting gigs, Isabelle is a partner at indoor cycling studio Ride Revolution and mobile gaming company Xeleb Technologies. Adrien grew up in a small village in Alsace, spending most of his childhood looking after his siblings (he is the eldest of five children) and, much like his other half, playing sports. He was 28 years old when he left France to take up the post of general manager for Adidas Philippines, soldiering on despite feeling homesick in a country where he knew no one, miles apart from his family. Though she gave him a bit of a hard time in the beginning (“I even brought Bea [Soriano- Dee] to accompany me on our first date!” she shares), Isabelle found herself enjoying Adrien’s company. She liked that they shared the same values and found him different from the other guys that she had hung out with before. They took their time getting to know each other and falling in love, while gradually ticking places off a shared travel bucket list (they have done nine out of 10 so far, with Iceland as the last item). After seven years together, Adrien proposed to Isabelle on a beautiful day in Cappadocia, Turkey. In September of 2016, they wed in an intimate ceremony at St Francis Church in Tuscany, Italy. It was a charming, DIY sort of affair, with many of their friends and family members making their own contributions. Rather than simply celebrate themselves, the couple wanted to bond with their guests to truly enjoy the festivities. Both were looking forward to eventually becoming parents, but a baby was not quite in the cards just yet, even after they had tied the knot. Isabelle, who had been booked for a new show, was floored when she found out she was pregnant just a few days before the first taping. “That night, I was having dinner, and Belle, without a word, just stood up and went upstairs,” shares Adrien. “And then I heard shouting, so I ran up, thinking I had to kill a spider for her or something! There she was, sitting in the bathroom, going, ‘Babe, babe, look!’ while waving what looked like a thermometre at me. It turned out to be a pregnancy test, and the result was positive.” Neither could quite believe what they’d seen. Adrien was trying to rein in his happiness, keeping a realistic attitude towards the good news (“It felt too beautiful to be true at the time!”) until they could verify it with a physician. When her pregnancy was confirmed, everything made complete sense to Isabelle, who had been feeling under the weather for about a month. For Adrien, who was used to looking after small children, the thought of becoming a dad was an eye-opener. Though he had been around for when his mum was pregnant with his younger siblings, he did not realise how difficult having to carry a child truly was and how essential the support his father provided had been. “There is nothing that can prepare you for becoming a parent—anyone who has a young child is now a mentor. You find yourself listening to your own parents more because there is a newfound respect for what they went through while raising you now that you are experiencing it for yourself,” he adds. While she’s finding her footing as a parent, Isabelle actively supports causes that mean a great deal to her. In July, she shared a video of herself at a mental health awareness forum, where she spoke of how close friends and relatives came to her with stories about their battles with depression. “I feel so strongly about it because many of the people I love are affected by it,” she says. “The common denominator was that everyone felt ashamed of what they were going through, which really got me wondering because needing help isn’t something we shouldn’t be embarrassed about. I called a friend—who was an organiser at the event I did my talk at—and said we needed to do something about it. She invited me to come and speak if I felt comfortable enough, but I had to think it over because it might not be of help to have all this come from someone who isn’t clinically diagnosed with depression.” It was Adrien who offered further encouragement, saying that many had approached her simply because she’d offered a sympathetic ear by asking how they were doing. “Sometimes, simply having someone to talk to—not a yoga session or a visit to the therapist—is all they need to feel better,” he adds. Isabelle is grateful for her own support system, as they keep her grounded and remind her not to put too much pressure on herself to be a perfect mum. She confesses, “When I was younger, I never imagined that I could love someone this much—but here I am now, a clingy mum obsessed with her kid. But I’m making it a point to set aside time for just myself, as well as time for myself and Adrien.” She won’t be making an active return to showbiz yet, but she is working on putting up her own preschool (she graduated from De La Salle University with a degree in early childhood education), hoping to create an environment where her son can blossom. “The most important thing right now is raising this boy the best way we can,” she says fondly.